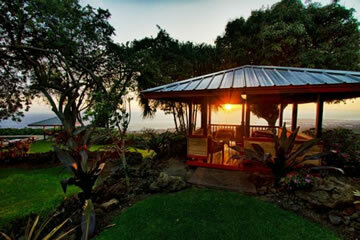 Enjoy stunning ocean views and unforgettable sunsets from our luxury boutique hotel near Kona Beach. 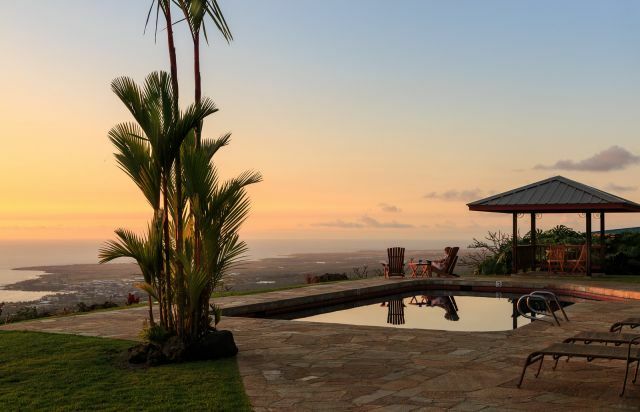 Set on a spectacular 30-acre Kona coffee estate surrounded by lush tropical gardens, Holualoa Inn offers unparalleled peace and relaxation. 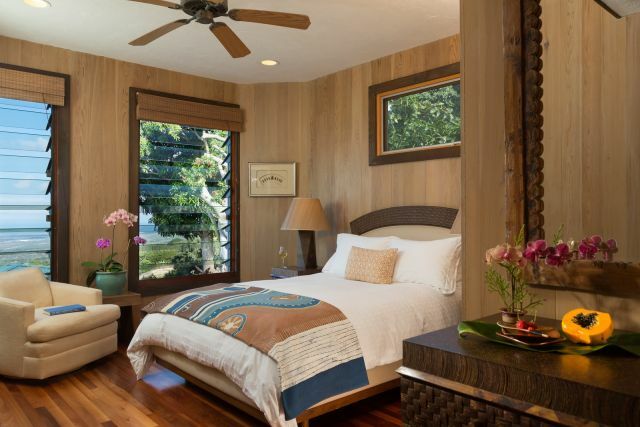 Choose from elegant rooms, spacious suites or a private cottage featuring deluxe private bathrooms, handcrafted Asian furnishings, fine local art and luxury bedding. 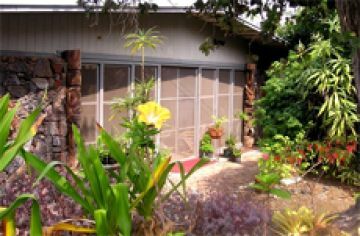 Holualoa Inn has been in operation since 1987 and is one of the first and most well established Bed and Breakfast Inns on the island of Hawaii. 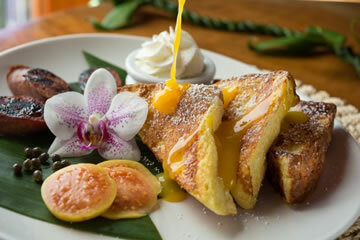 It has been featured in numerous national and international publications including the New York Times, The Washington Post, The Los Angeles Times, The San Francisco Chronicle, Gourmet Magazine, Bride and Vogue. 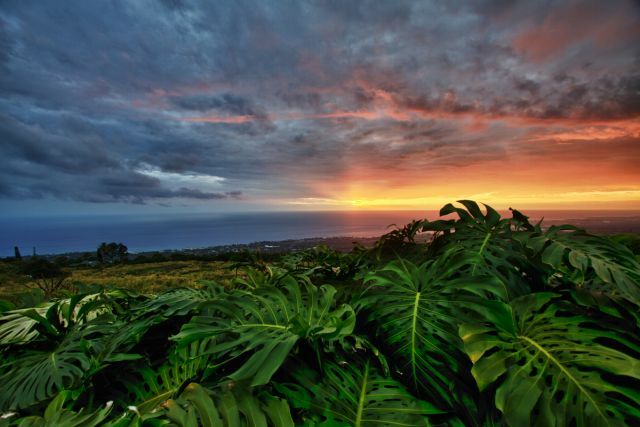 Experience Hawaiian hospitality at its best! 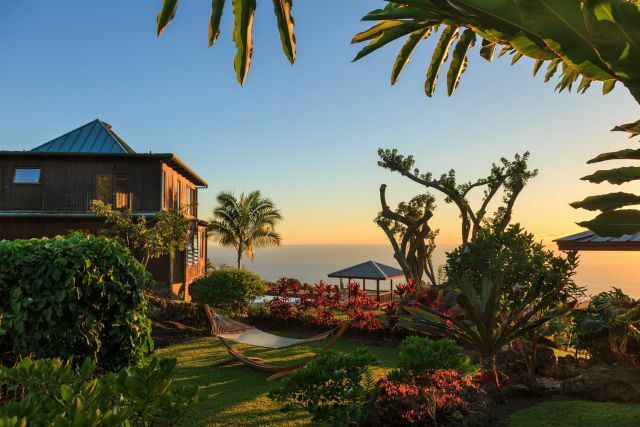 Perched on the slopes of Hualalai, 1,400 feet above sea level, and located within walking distance of the artist's village of Holualoa, the Inn is central to the nearby town of Kailua-Kona, as well as Keauhou, Kealakekua Bay, and the white sand beaches of the Kohala Coast. 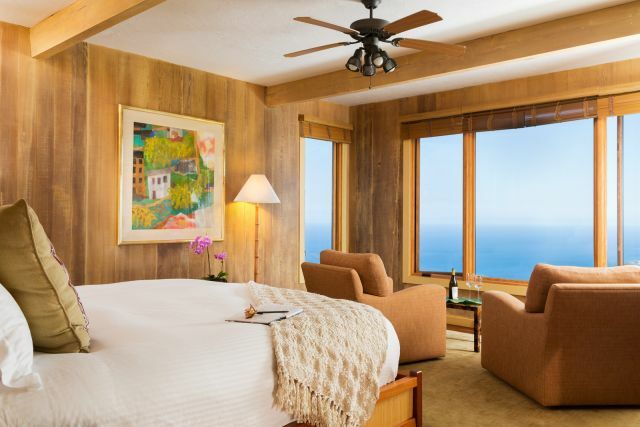 Each of our beautiful guestrooms feature hand-selected, traditional furniture, crisp, high-thread count bed linens, sitting areas, ceiling fans and private bathrooms. 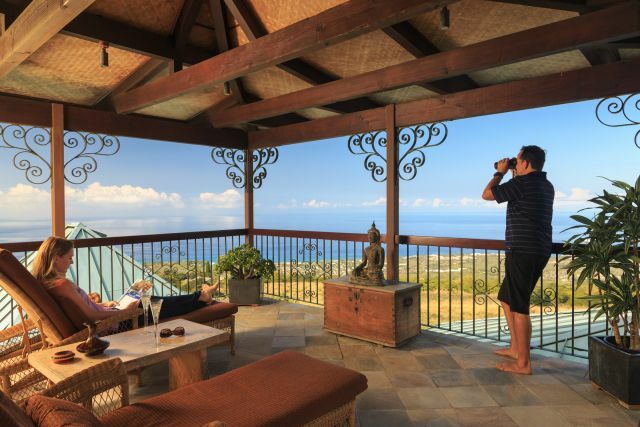 The Gardenia Suite has stunning panoramic views of the Kona Coast and the private balcony overlooks our pineapple garden and Kona coffee trees. The Plumeria Suite offers ocean views and is situated privately on the main floor adjacent to the pool. The Coffee Cherry Room boasts a hot tub spa with a private side entrance and luxurious king bed. 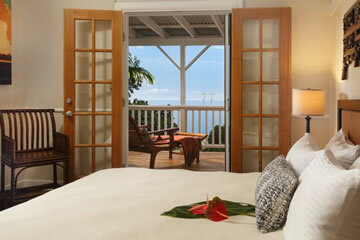 The Hibiscus Room wakes to a beautiful view of the Kona coastline from a king bed. 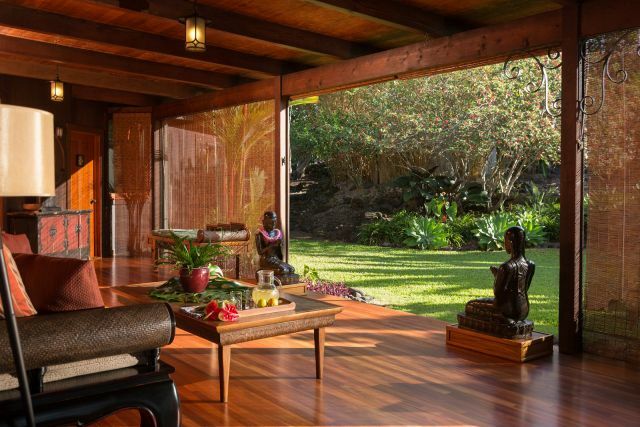 The Orchid Room has views of the ocean and garden windows that catch the fragrant tropical breezes. Queen bed. 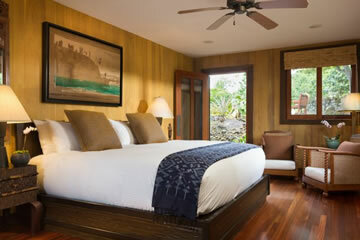 The Ginger Room has a private balcony overlooking our lush gardens and Kona coffee trees. Queen bed. 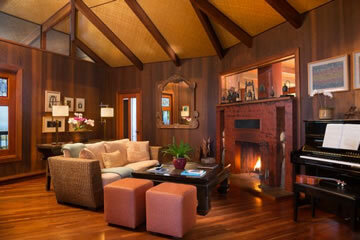 Our two suites feature king beds and separate sitting rooms that may accommodate an additional person for $75 a night. 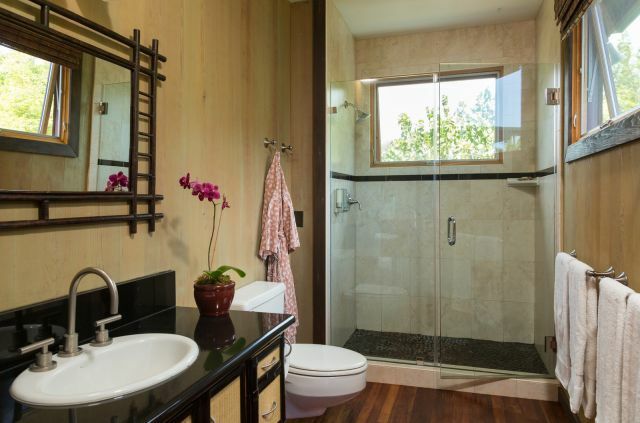 The Darrell Hill Cottage is freshly renovated and is now taking reservations. 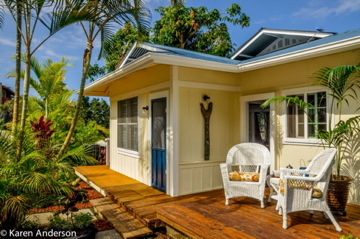 The spacious cottage has one large bedroom with two sets of french doors; one set opening to the wrap around deck and ocean views and one set opening into the large dining/living room and a large kitchen stocked with expanded continental breakfast items for guests to prepare on their own. This secluded cottage on the Holualoa Inn estate grounds is best suited for a romantic getaway, honeymoon and anniversary. 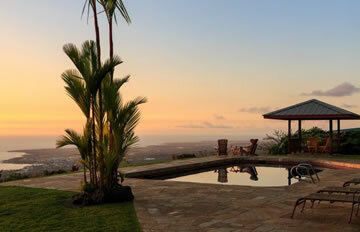 $385 - $570 single or double occupancy. 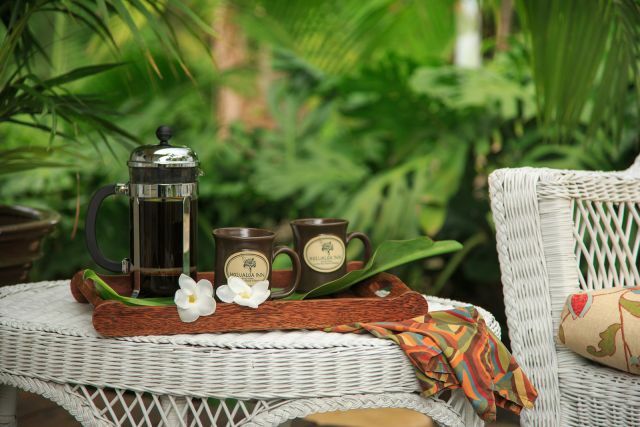 At the Inn, wake fully rested to the smell of one of the best coffees in the world, grown on property at our Big Island Kona Coffee Estate Bed and Breakfast Inn. 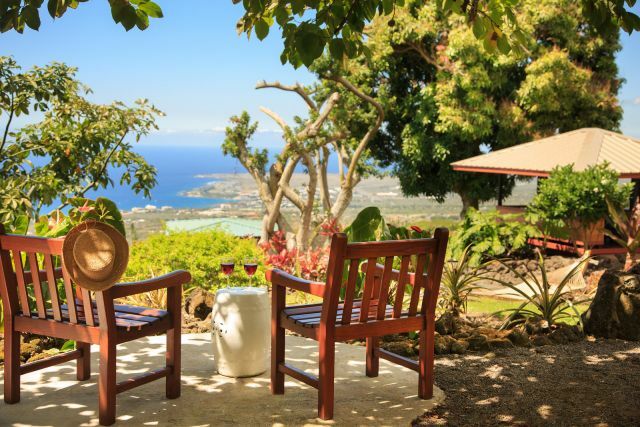 Then sit down to the blue ocean view and indulge in the freshest, sweetest, exotic fruits and our signature gourmet breakfast. 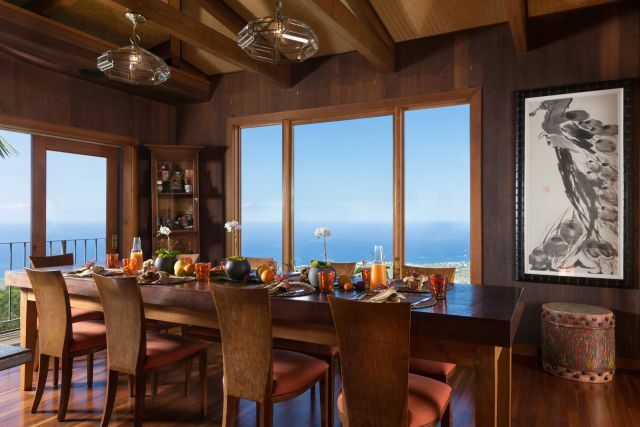 In the Darrell Hill Cottage, enjoy an expanded continental breakfast on your own in the cottage and on the back deck as you enjoy the ocean view. 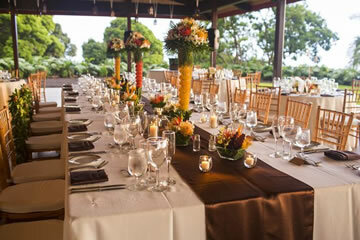 At the Inn: Roof-top gazebo, custom-tiled ocean view swimming pool, covered outdoor lanai with relaxing day bed and rocking chairs, lush, tropical garden paths, new open-air pavilion for weddings and events, pineapple gardens, fruit orchard,on-site massage, outdoor massage pavilion, guest laundry facilities, ohana room with a kitchenette for the inn's guests to enjoy, a gas barbecue, and cozy fireplace. 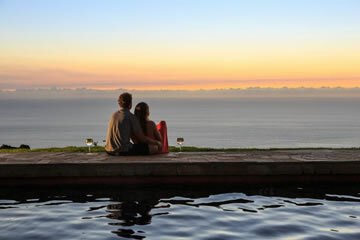 At the Cottage: Make a reservation for an outdoor couples massage or in the cottage, enjoy the inn's pool and grounds. Cash, Travelers Checks, Visa, MasterCard, American Express, Diners, Discover. Reservations are confirmed with a one-night advance payment by credit card or check. The balance is due upon check out. Partial stays are non-refundable. Advance payments for reservations cancelled more than 45 days prior to arrival will be returned less a $50 administration fee. 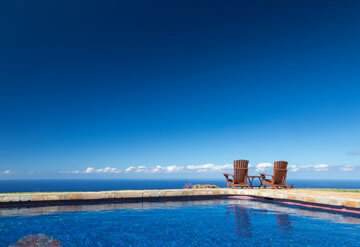 Cancellations made within 45 days of arrival are subject to the full amount of the stay. 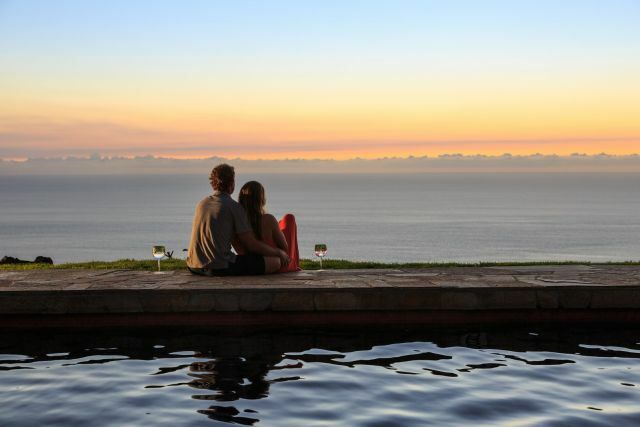 "Literally the loveliest place we've ever stayed, with the most amazing hospitality and not to mention coolest! Many thanks for a wonderful honeymoon!" "Wow, we have paradise. It was an amazing place to stay and we hope we return soon. Thank you for everything we loved it, to be alone in the house. It feels like home and we have a wonderful time at the "Holualoa Inn"!"